Normandy's landscape is green, pleasant and rolling. From the waves of La Manche (The English Channel) lapping against smooth sand dunes to the green meadows. We have a wide range of accommodation for you to choose from in the region. 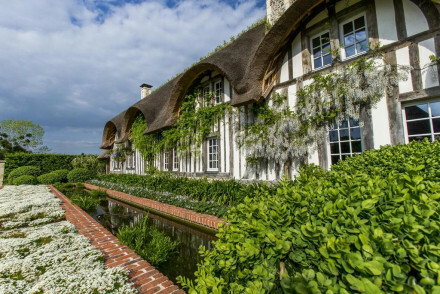 Our selection of the best places to stay in Normandy encompasses chic farmhouse B&Bs, seaside hotels for all the family and luxury retreats for a spoiling break. If you drive through this rural countryside you'll see apple orchards and cows. Many of the tiny towns you come across will have their own local cheeses named after the town - such as the most famous soft-cheese, Camembert. The apples are for cider which you may find goes surprisingly well with the cheese. For off-the-beaten-track Nornandy you could start your search in Moutiers-au-Perche, a quiet backwater, perfect for some down-time. Camembert - and every other town seems to have its own cheese. Pont l'Eveque, Livarot and Pave d'Auge are some of those most frequently recommended. But stroll the lanes in the dairy farming heartland between old villages and all seem to produce their own cheeses which are served up in the many excellent little hotels and restaurants. The French themselves come here for the food and the local style (a la normande) is thick, buttery and creamy. But rural idyll is not what first springs to mind at the mention of Normandy. Many people will think first of the famous beach-battlefields of WW2. Today the famous 80km of beaches where the D-Day landings took place are just wide open stretches of sand. Fringed occasionally by a fishing village or seaside resort and of course the many memorials, museums and cemeteries commemorating that period. We recommend that you base yourself in Le Havre, Cherbourg or Bayeux for easy access to all these sights. 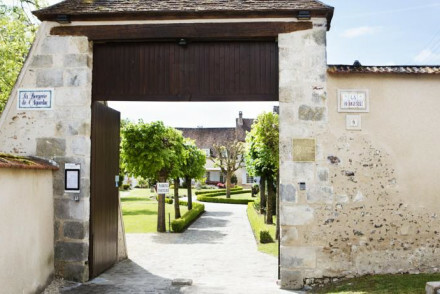 There are lots of small museums and memorials but in Bayeux you'll find the Commonwealth War Cemetery, the largest British Commonwealth wartime cemetery in France, home to the graves of 4,144 British dead, and the memorial for another 1,800 whose bodies were never recovered and the Bayeux Military Museum. In Caen is the Peace Museum. The name Bayeux is also synonymous with the great tapestry. This 900 year old, 70 metre length of seamless embroidery tells the story of William the Conqueror's disputed claim to the British throne which was eventually settled during the Battle of Hastings. Chartres is another good place to stay for history buffs. It has a world famous gothic cathedral in a completely charming old town. Plus you're only an hour from Paris by train. Barneville-Carteret is one the best places to stay in Normandy for seafood. It's has a bustling port and there are plenty of great restaurants. Normandy, and especially the areas along the Seine, has a long tradition of producing art. The Impressionists gathered here to paint the area's strange and wonderful light and Honfleur is renowned for its connections to these artists. Giverny is where Claude Monet, one of Normandy's most famous sons, made his home after he'd become successful. His house and gardens - and especially the famous waterlily lake - are now a great museum to his life and work. A museum where many of the objects have remained in the same position since he lived here himself. Rouen is a good destination for art lovers. As well as his gardens at Giverny, Monet also famously painted Rouen Cathedral - day after day. Some of his cathedral work can be seen at the Musee des Beaux Arts, along with many other Impressionist and Flemish works. Another of the best places to stay in Normandy for art lovers is Etretat, a charming little seaside resort made popular at the turn of the century by artists such as Edgar Degas, Eugene Delacroix, Gustave Courbet and Monet. 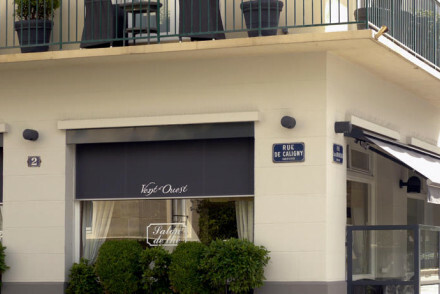 Ivan Vautier in Caen boasts five stars worth of sleek and contemporary rooms with a Michelin starred restaurant. 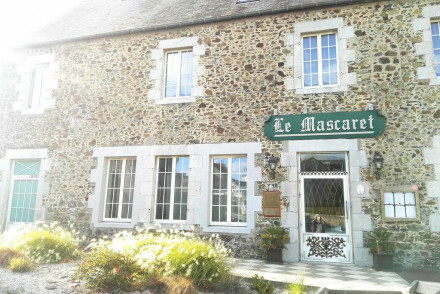 Le Mascaret is also one of the best places to stay in Normandy for foodies. Its kitchen has a Michelin star, but its not super-fancy-French, just excellent. This is also one to book if you like quirky hotels. The five rooms have all been individually decorated - some with more style than others. But the courtyard, swimming pool and terrace are all lovely. Le Manoir du Lys offers gourmet michelin starred cuisine in a beautiful setting in the Andaine Forest. Bedrooms are stylish and contemporary plus you can enjoy the swimming pool, tennis court and lovely gardens. La Marine overlooks the bay in Barneville-Carteret. Here you'll find Michelin starred dining along with bright contemporary rooms and glorious views. 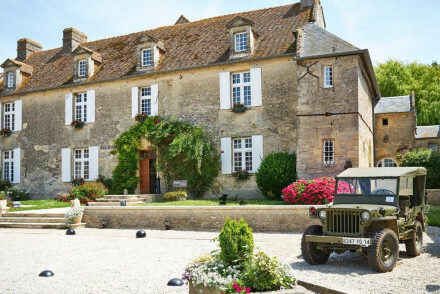 Chateau la Cheneviere is perfect if you want a gourmet base close to the D-Day landing beaches. The ethos here is to champion Norman ingredients and much is grown in the property's own veggie garden. 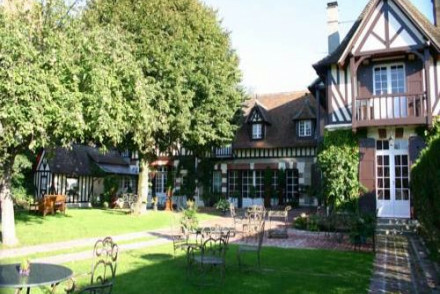 La Chaumiere is a gorgeous little hotel on the sea front in Honfleur. 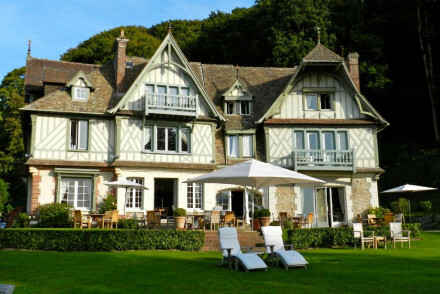 One of the best places to stay in Normandy for a seaside break with direct access to the beach and luxurious chic interiors. 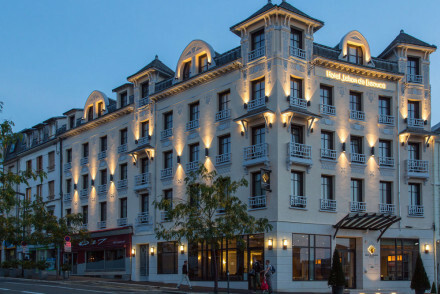 Le Grand Hotel in Cabourg is evocative of a by-gone era from the outside, but inside all is sleek and very much up-to-date. Ideal for a luxury seaside holiday. 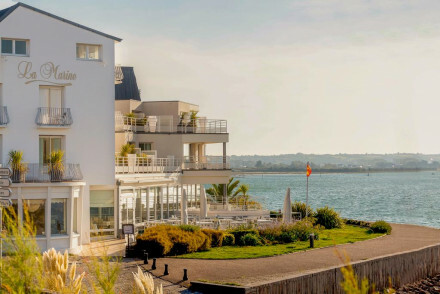 Hotel des Isles is a New England style property with stunning views over either the English Channel or Cap Carteret. It's excellent value too, with doubles from only €114 per night. 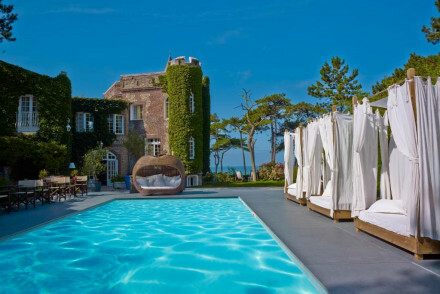 La Cheneviere ticks most of the boxes for a family stay - heated pool, tennis courts, close to the beach and golf courses. Plus luxurious accommodation and a gourmet restaurant. Le Flaubert is practically on the beach and boasts huge rooms and family suites with private balconies and wonderful seaviews. It won't break the bank either - doubles (with a seaview) start from only €110 per night. 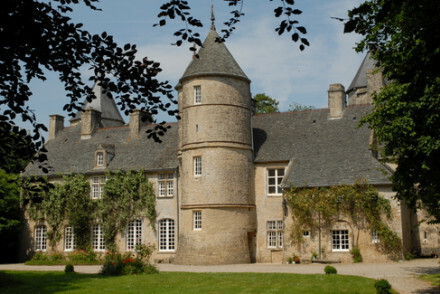 The Château du Rozel is on the ‘manor house-y’ side of the château scale, located just minutes from the coast with beautiful views ad lovely grounds. There are four rooms with the château and several cottages on the grounds, which have all their own facilities and views out to see. 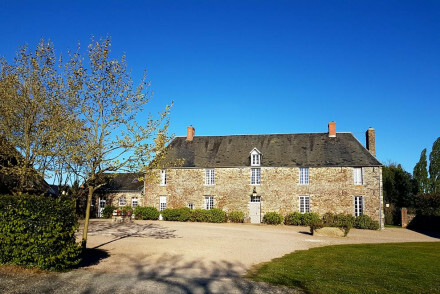 The Château de Flottemanville is an elegant château B&B with three rooms ad a number of cottages with living areas and kitchens. There’s also a chapel in the grounds. The decor is quite traditional, but less so in the cottages, which are well set up for families. 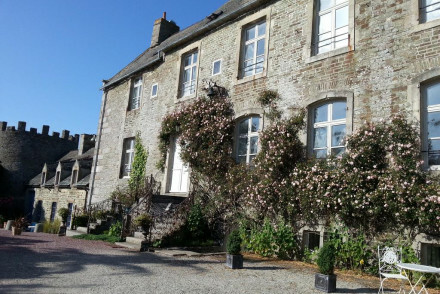 One of the best places to stay in Normandy if you're after great value is the Hostellerie de la Renaissance. This charming restaurant with rooms offers simple, contemporary accommodation and fantastic food! It's a great base if you want to explore the Pays d'Auge. Doubles from as little as €89 per night. 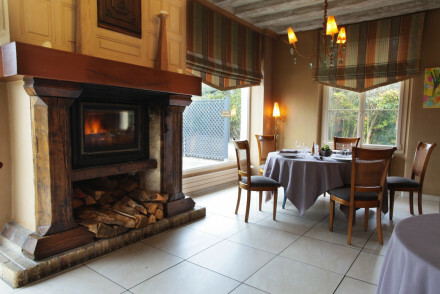 Auberge de la Source is another lovely restaurant with rooms. 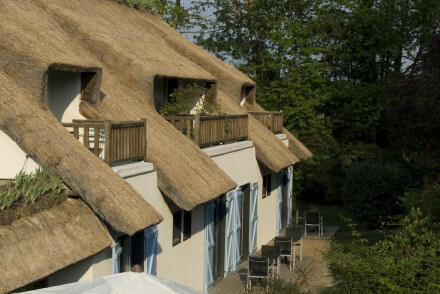 Just 4km from Honfleur, here you'll find chic accommodation in a delightful half timbered farmhouse all from only €115 per night. 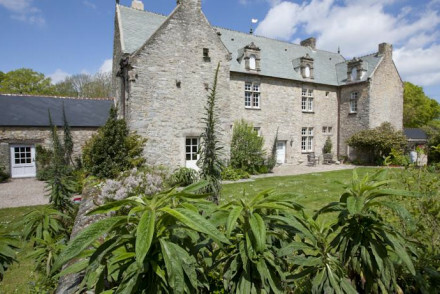 Right down in the south of the Cherbourg Peninsula, close to Mont Saint Michel Abbey, La Ramade is a beautiful converted mansion on expansive grounds. You’re close to the coast and surrounded by great walking opportunities. Normandy is serviced internationally by airports at Caen and Deauville. Another good option is to fly to Paris Beauvais. Ferries between the UK and Normandy are very simple with services running to places such as Cherbourg, Roscoff, Calais and Dunkirk. For those interested in hiring a car, visit our online partner Rentalcars. For a chance of catching good weather, visit from May to September. Browse through our list of all the best places to stay in Normandy. Or feel free to call or email one of our gurus for advice. 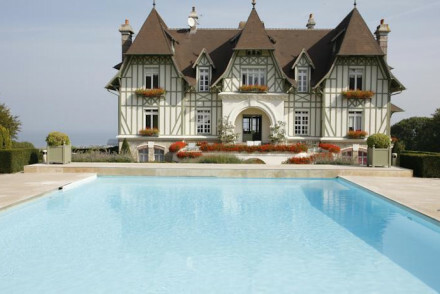 A luxurious 18th century chateau on the coastline. Traditional and elegant interiors include enormous rooms and suites, a classical French restaurant, and an inviting bar. Heated pool, tennis courts, golf and beaches nearby. A fantastic spot for a romantic break filled with sporting activities. 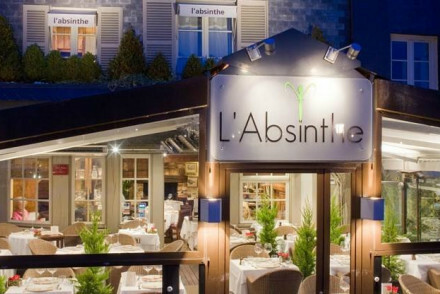 Foodies - The restaurant serves classical cuisine based on the flavours of Normandy. 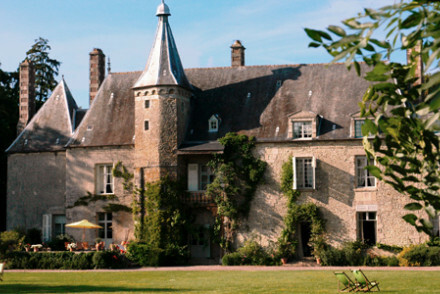 Once an ancient hunting lodge and then an 18th century castle, this Chateau is filled with character. Offering comfortable and individually styled bedrooms with en suite bathrooms, each room has its own fireplace and rustic wooden floors. Enjoy beatiful views over the surrounding park and pond. A fine stately home dating back to the 16th Century with 12 hectares of land, private fishing pond and an exciting history. Individually decorated bedrooms are traditionally french in style with antique sleigh beds and garden views. 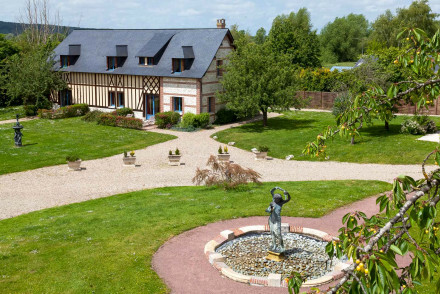 A charming base for exploring the Normandy countryside. 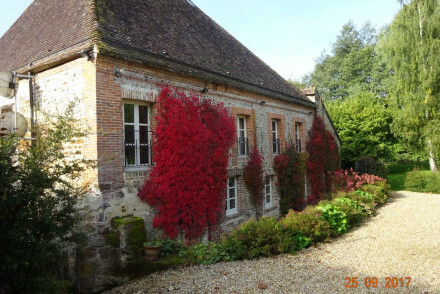 A charming rustic farmhouse just outside of Bayeux. 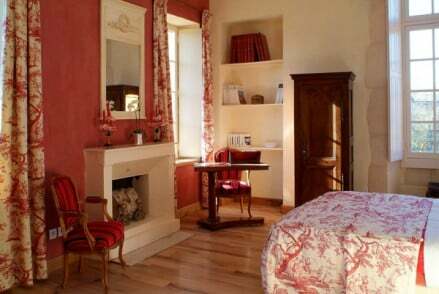 Gorgeous traditional french rooms with chintz fabrics, beamed ceilings and white washed exposed stone work. A large garden ideal for children or simply relaxing. Indulgent breakfasts. Well located for exploring Normandy. A lovely rural abode. Families - Family suites, a small playground and plenty of space to keep little ones busy. Local exploring - Close to the D Day beaches and just 10 minutes from Bayeaux. Country Escape - A rustic property in rural Normandy. Sights nearby - Head into Bayeux to visit the Notre Dame Cathedral and the Bayeux Tapestry. A charming B&B. Just two rooms and one suite (sleeps 4) in the eaves of a half-timbered bakery. 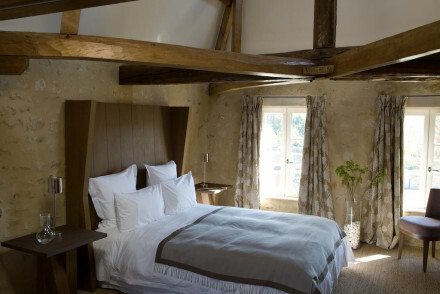 Wooden beams, stone floors, and comfortable beds. Fresh bread for breakfast! A great choice for groups and families, and great value. 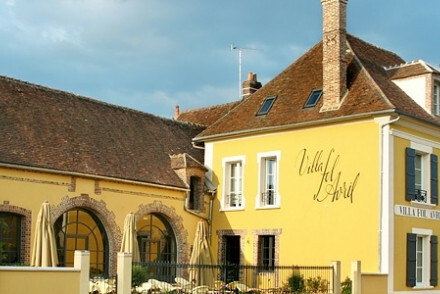 A charming yellow hotel in a sleepy village. 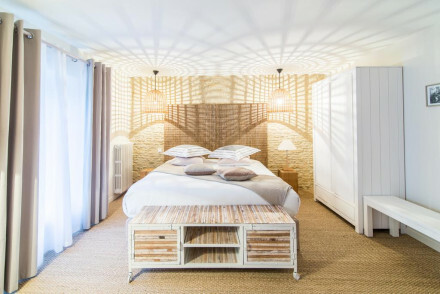 Sunny bedrooms with wooden beams and funky furnishings, wooden-decked swimming pool, and excellent restaurant. Great value for money. 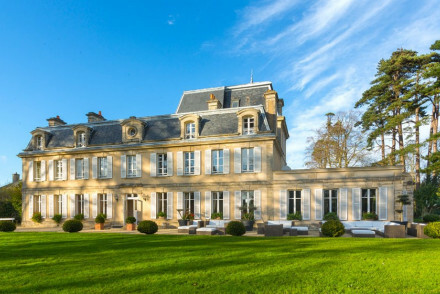 A collection of four striking mansions set in picturesque Normandy countryside. Interiors are traditional yet unfussy with exposed beams and stonework, open fireplaces and antiques. Superb classic Norman cuisine is served in the atmospheric restaurant and there's plenty to explore within the region. Local exploring - Well positioned to explore Normandy's historical sights and to access the beach. Sights nearby - Visit the striking 13th century Bayeux Cathedral. There's a warm welcome at this rural oasis. Inside a pretty half-timbered cottage, set in lush gardens, you'll find contemporary comfort combined with elegance and interesting personal touches. The guest-rooms are bright and airy. Excellent breakfast included and table d'hotes available on request. Expect a warm welcome at this gorgeous guesthouse in a half-timbered 17th-century priory near Pont-l'Évêque. 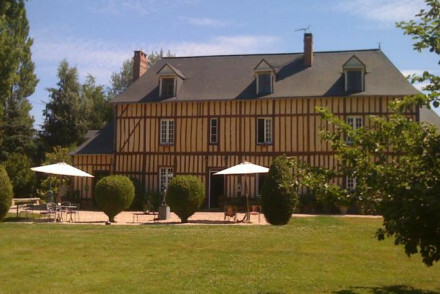 Two rooms and a suite, decorated in chateau style, occupy creatively converted stables. A heated outdoor pool adds to the fun. A perfect base for exploring Calvados and the Normandy coast. A beautifully restored 16th Century building. In a tranquil spot next to the Eure river it succeeds in providing guests with a comfortable and relaxing stay. The renovated building now displays its original big french windows and beautiful sandy stone walls. Gorgeous in all its former glory. A beautiful sandstone country house with white shutters set in picturesque gardens. Friendly hosts, an excellent table d'hotes, and terraces all around the property. The bedrooms and two suites (sleep 4) have Art Deco touches, parquet floors and fireplaces. A great choice for families or couples. Great walks - The footpath leading from Chartres to the Mont St Michel passes right outside. A gorgeous timbered B&B. Rustic chic rooms and a family suite. White walls, wooden beamed ceilings, white furnishings, stone flagged floors, and modern art works. Very stylish and great value. A charming converted farmhouse offering cosy accommodation and delicious home-made breakfasts with the majority of the produce grown on site. Interiors are fresh and chic with a clever of mix of original features and contemporary style. 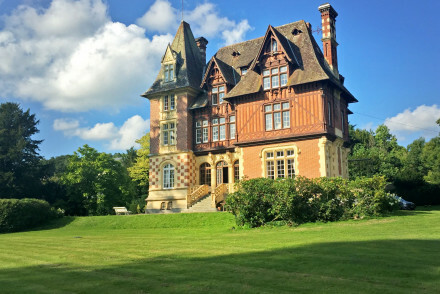 A relaxing low key stay in the heart of Normandy. Country Escape - A rural idyll in a pretty corner of Normandy complete with friendly hosts and delicious organic breakfasts. Local markets - Explore the local markets in Gisors open on Friday and Sunday mornings. A B&B with bags of character. Unique rooms have Indian-style decoration with dark wood furniture, colourful rugs, and tiled bathrooms. The garden opens onto the golf course and the sea cliffs are close by. Quiet, quirky and welcoming. Lovingly restored 19th-century water mill in the heart of the Perche Regional Nature Park and Normandy's horse-breeding country. Four rooms, one with a four-poster, are furnished in a pretty traditional style. Rest and recharge your batteries or explore the idyllic countryside and quaint villages. A simple townhouse bed & breakfast offering unfussy rooms with stunning views of the Cathedral. Bedrooms are elegant in shades of white with parquet floors & some have private balconies. Close to main shopping streets, there is lots local exploring on the doorstep & plenty of restaurants nearby. 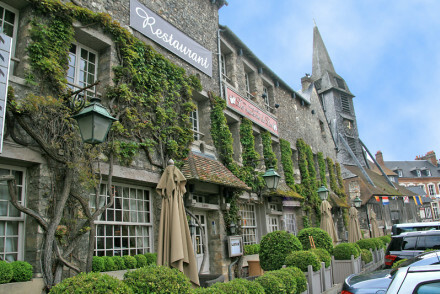 A gourmet restaurant with rooms in Argentan. Simple contemporary rooms at great value. The emphasis here is on the food and wine in the restaurant. A spot for gourmet local cuisine in a warm atmosphere. A delightful hotel in the heart of the Andaine Forest. Contemporary rooms feature colourful furnishings and large windows. Outdoor and indoor pools, gardens and tennis courts to enjoy. MIchelin star cuisine and a chic bar area. Perfect for a romantic break filled with culinary treats. Beautiful mansion hotel set in expansive gardens. 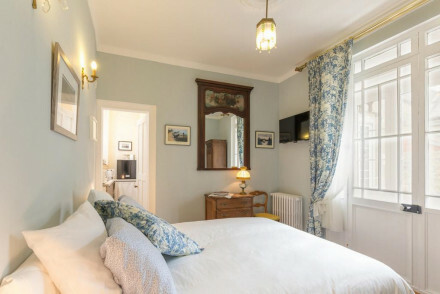 Stylish rooms are decorated in a classic French decor Explore the stunning Mont Saint Michel and surrounding Norman coastline or just as easily relax in the lovely garden. A great value option. Fishing - Wonderful river fishing in Normandy, on the Andelle and the Contentin. Sights nearby - Eight miles from the UNESCO World Heritage Mont Saint Michel Abbey. Great walks - Great walking along the beautiful Norman coastline. A newly renovated traditional house now a glamourous boutique with original elements. Rooms feature antique furniture, romantic drapes, and large bathrooms. Manicured gardens and a terrace. A charming stay for a seaside weekend. Huge rooms and family suites with private balconies and sea views. This ultimate sea side hotel is practically on the beach. Contemporary interiors with lots of exposed wood and funky wall pictures. Excellent value for money, and great for families or groups. A picture perfect thatched house offering chic accommodation and an excellent gourmet restaurant. Rooms are simply dressed with soft hues and indulgent modern bathrooms. The restaurant serves a creative menu using local produce, there's a large pool and glorious surrounding walks. Foodies - Feast on gourmet regional dishes in the atmospheric restaurant. Great walks - Discover the beautiful surrounding countryside on long walks starting straight from the property. 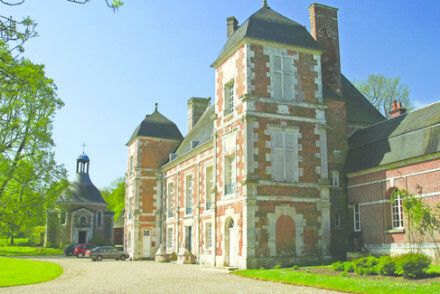 Sights nearby - Take a tour of Château du Champ de Bataille, built in 1651. A friendly and relaxed farmhouse surrounded by luscious countryside and woodland. Various accommodation - rooms, suite, and apartments - cater to groups, families, and couples. Wooden beams, stone flag floors, and fireplaces. Swimming pool and terraces. Very cosy. In the heart of rural Normandy, this authentic 17th-century farmhouse delivers a meticulous hybrid of old and new. A traditional, lovely garden and exterior is counterbalanced by a pool and sleek interiors where you'll find neutral tones and minimalist design. A chic base for exploring the region. Spa - spa facilities include a fitness centre, solarium and a range of body treatments. Pretty B&B in former schoolhouse. Rooms feature exposed brick walls, cozy lighting, modern bathrooms and big French windows. Restaurant serving fresh daily breakfasts, sun terrace to enjoy. Walkable to most of the town's delights. 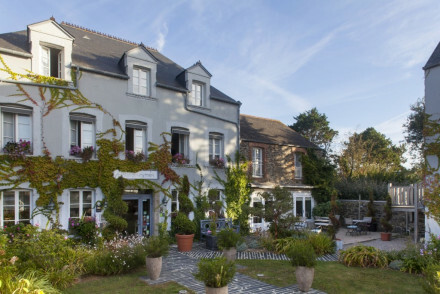 A charming Normandy stay. A charming B&B boasting a secluded spot within the heart of Bayeux. A handful of individually styled rooms are traditionally dressed. Indulgent continental breakfasts are served in a light and spacious dining room. An ideal base for exploring the historic town. Local exploring - Ideally placed to explore historic Bayeux on foot. Sights nearby - Marvel at the architecture of Notre-Dame Cathedral of Bayeux. Great walks - Meander through the 19th century Botanical Gardens. A small understated hotel close to the sea and not far from the shopping and restaurants. Bedrooms over three floors and three apartments with private balconies. Billiards room, meeting rooms, and cosy sitting rooms. Great for short stays or longer business stop overs. 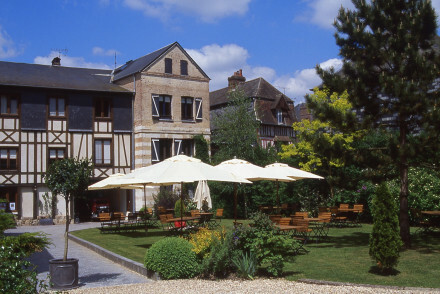 Comfortable hotel in the centre of Chartes. Elegant guestrooms have art deco touches with creamy furniture, big bathrooms and even bigger suites with sofas. Sauna and lobby lounge to relax in. Friendly service and plenty of recommended restaurants within walking distance. 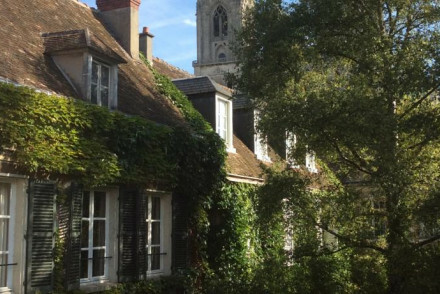 A delightful little B&B a stones throw from Chartres' magnificent Cathedral. The ornate rooms with beautiful wall papers and charming knick-knacks give the place real character. 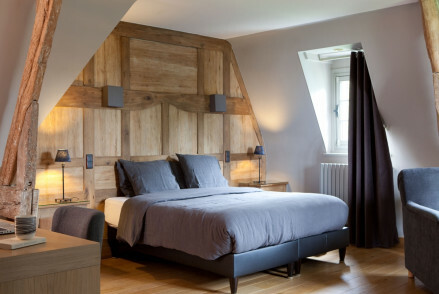 The perfect place to stay for a weekend of exploring the picturesque Norman city of Chartres. 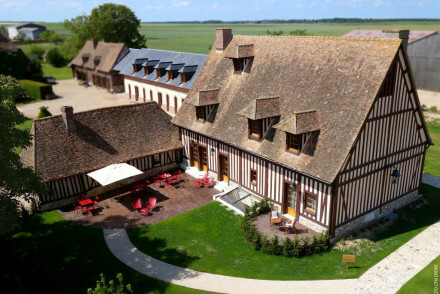 Local exploring - Ideally located for exploring Chartres, within walking distance of the main sights. Local markets - Guests will love exploring the local markets of Chartres, ask your hosts what days these are held. Sights nearby - Cathédrale de Chartres is two minutes walk away, as is the Municipal theatre. A small and charmingly atmospheric B&B situated in the heart of Arromanches. Lovingly renovated throughout the property is light, bright and mixes traditional and contemporary styles. Housing its own small WW2 museum and within striking distance of the region's historical sights. Local exploring - As the name suggests this is the ideal property for exploring the region's historical sites. 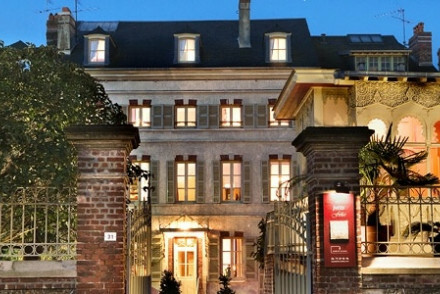 A stunning mansion with classical french design throughout. Lovely, individually designed rooms, with large sash windows, pretty fabrics and antique furniture. An indulgent breakfast served. Well located to access Bayeux's attractions. Very reasonably priced. A real gem of a property. 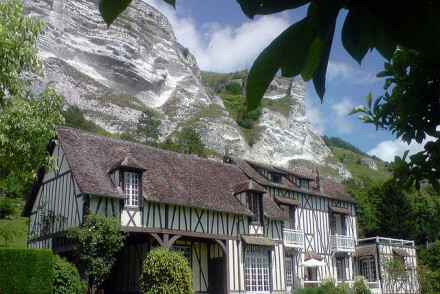 Local exploring - An upmarket guesthouse in a lovely part of Normandy with plenty to do in the surrounding area. Sights nearby - Make a day trip to the iconic Mont St-Michel or in very close proximity is the Notre Dame Cathedral. Great walks - Take a stroll through the pretty Jardin Public de Bayeux. 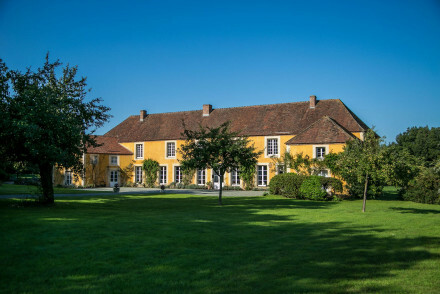 A traditional rural property set in the picturesque village of Jumièges. Individually styled rooms are light and spacious, the best feature wood panelled walls. A spoiling spa aids total relaxation and there are numerous sporting and cultural activities in the surrounding area. 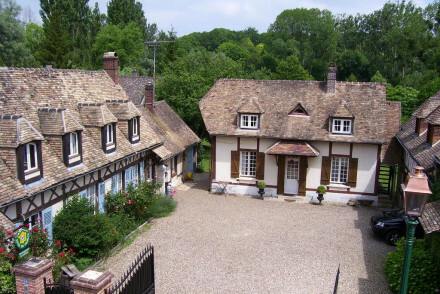 Country Escape - A classically French half timbered house in a quaint village. Sights nearby - Discover the stunning Abbey in Jumièges itself. A picturesque yellow house set in beautiful 'Monet' countryside. Interiors are traditional, yet polished, with a choice selection of antiques, well thought out colour scheme and pretty french patterns. There's plenty to explore in the region, the breakfasts are sumptuous and hosts very friendly. 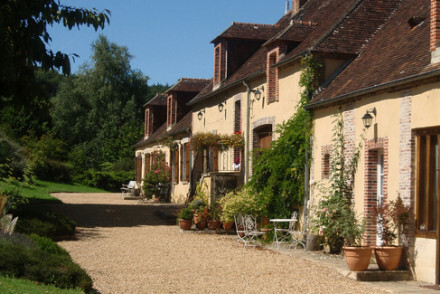 Country Escape - A charming country house set in pretty (quintessentailly french) countryside. Sights nearby - Marvel at Chateau-Gaillard that has stood on its rocky spur for more than 800 years. Great walks - Discover plenty of scenic country trails starting straight from the property. This 18th-century manor house is a haven of peace nestled in large, lush grounds. 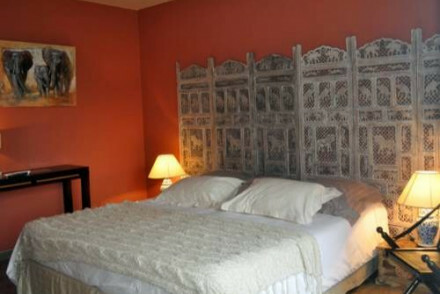 Four individually decorated bedrooms and one gîte provide ample family accommodation. A romantic ambiance with four poster beds and antiques. Well positioned for visiting the D-Day sites and Bayeux Tapestry. A New England style beach house with excellent sea views. Rooms and family suites in fresh contemporary style with lots of natural light and outside decks. Swimming pool, hot tub, and lovely restaurant and terrace. A great beachside family spot, and at great value. 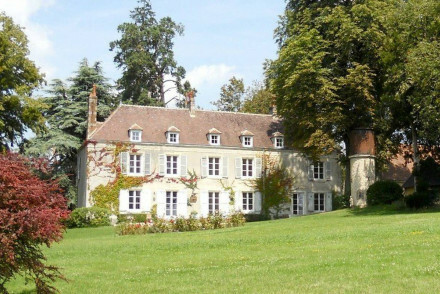 Charming B&B chateau within large park. Unique rooms exude elegance with four poster beds, French moulding on the walls and traditional bathrooms. Gardens, chapel, farm and cider press in the grounds. Utterly lovely and good value. 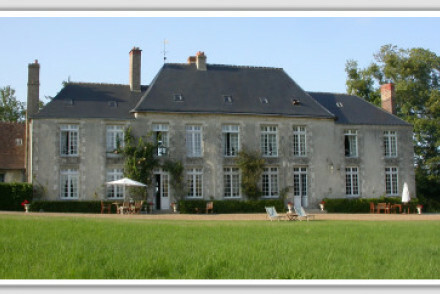 Elegant chateau B&B and cottages. 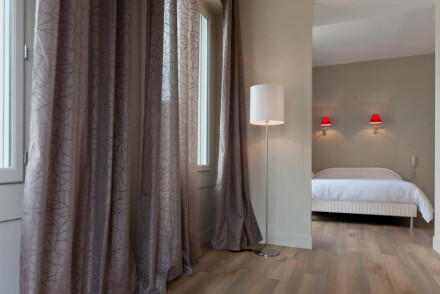 Rooms have creamy fabrics, parquet floors and antique style furniture. Cottages have living areas and kitchens, with wooden furniture. Chapel within the grounds. Quiet, pretty and good value for families. B&B in neo-classical mansion. 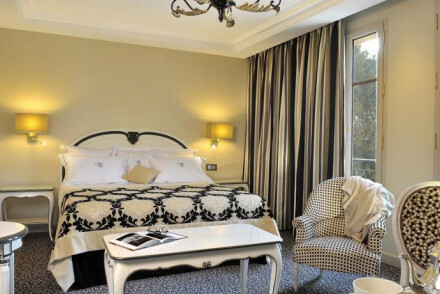 Large guestrooms feature French windows, pretty en-suite bathrooms and chandeliers. Library and charming dining room where breakfast is served, gardens to enjoy. Quiet, ideally placed and very friendly owners. 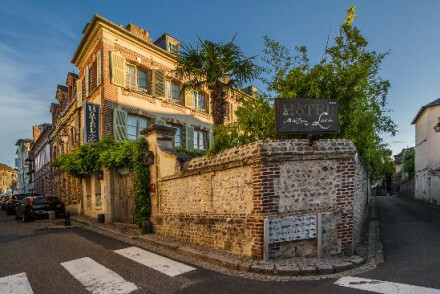 A beautiful vine-clad convent come B&B in the picturesque port town of Honfleur. Shabby-chic rooms are comfortable and spacious and feature vintage artwork and posters. A continental breakfast is served, whilst plenty of restaurants are in walking distance. Or visit the famed Camembert producers. Sights nearby - Five minutes walk away is the Port of Honleur that dates back to the Vikings. A striking manor house set in picturesque mature parkland. A handful of traditionally dressed rooms are filled with family antiques and decorated with classic French patterns. Indulgent breakfasts are served, there's a large pool within the walled garden and wonderful walks too. Country Escape - A grand country house offering fabulous walking and total tranquility. Great walks - Take long walks through the property's beautiful parkland. Sights nearby - Visit the Castle of Guillaume Le Conquérant in Falaise. Two converted villas offering chic accommodation in the heart of Trouville. Individually styled rooms are minimalist in design with plenty of light, crisp white linen and designer furniture. A central courtyard is a sunny spot to enjoy breakfast and the beach is just at the end of the street. Local exploring - Trouville is ideally positioned to explore the coast and attractions of Normandy. Sights nearby - Discover the old harbour, surrounded by numerous brick or slate-clad houses at nearby Honfleur. 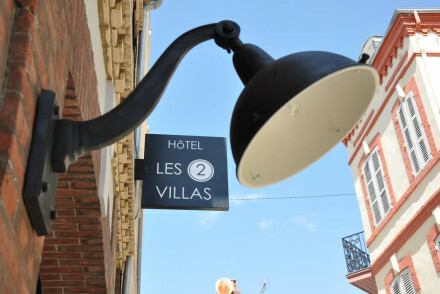 Lovely family-run hotel set in a beautiful redbrick building in Trouville-sur-Mer. Rooms are simple and focus on providing guests with comfortable stay. 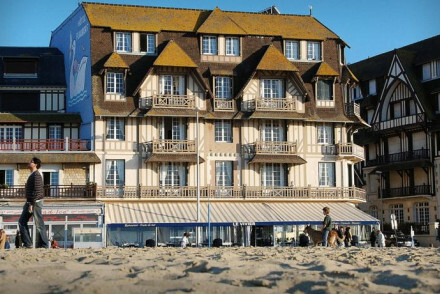 Perfectly located for exploring the Norman coast surrounding Trouville-sur-Mer. A great value option. Local exploring - A great spot for exploring the Trouville on foot, just a few minutes from the beach and the quayside fish markets. Sights nearby - The Port of Honfleur, a historic viking port, is eight miles away and well worth checking out. Local markets - Just two hundred metres from quayside fish markets, a fascinating spot for a morning stroll. 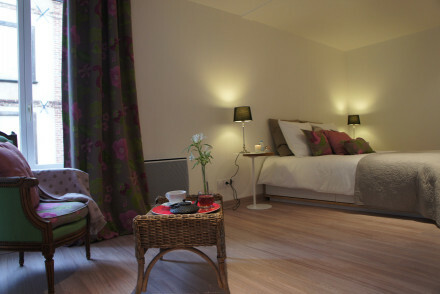 An intimate B&B on a delightful cobbled street in the harbour town of Honfleur. Various rooms sizes can accommodate groups of friends and families -the self catering cottage sleep five. All bright and airy in ochre tones. Walking distance to all the attractions and restaurants. 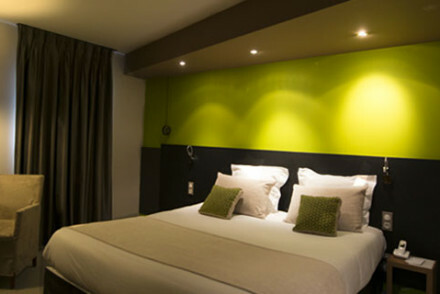 Michelin star restaurant and five star hotel with sleek contemporary rooms in the centre of Caen. All the mod cons, fantastic food, friendly service. A central spot for foodies and city style. Excellent base for visiting the D Day beaches and Bayeux. Restaurant - Michelin star restaurant. Sights nearby - Visit Caen Memorial Museum and Caen Castle. Close to Bayeux and the landing beaches. 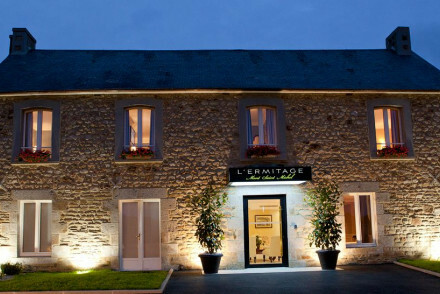 Charming rural hotel with an excellent Michelin starred restaurant. Kitsch bedrooms and suites, courtyard swimming pool, and terrace. An understated hotel with great food and service. 16th century chateau just outside of town. Unique rooms have floral interiors, modern bathrooms and garden views. Kitchen-garden, tennis court, 15th century chapel and terrace. Apartment with kitchen and living room is ideal for a family group. 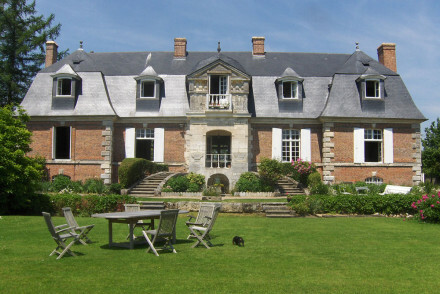 An elegant 16th Century mansion in the quiet countryside just 3km from Cherbourg. Gorgeous manicured gardens. A fine dining room and sunny, sheltered terrace for meals. Bedrooms are traditional in style but ooze sophistication, and bathrooms are bang up to date. Calm, countryside relaxation. A bright hotel overlooking the bay. Contemporary rooms feature modern bathrooms, subtle colour schemes, most with gorgeous sea views, and a few with private balconies. Excellent Michelin starred seafood cuisine, terrace, and bar. A relaxing spot, great for couples and local exploring. Foodies - Michelin star food from an acclaimed chef. Sailing - Aboard the Long John Silver. 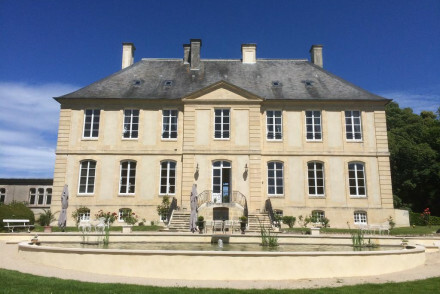 An imposing sand yellow chateau set within mature gardens in the pretty town of Bretteville l’Orgueilleuse. 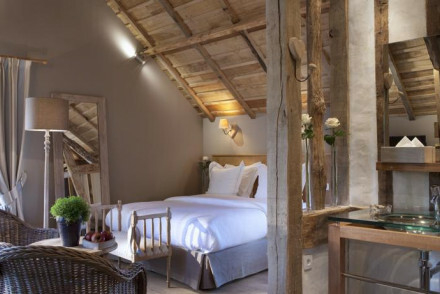 Simply styled rooms are traditional yet unfussy with polished wooden floors, white washed walls and exposed beams. 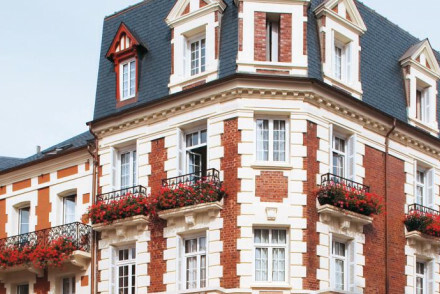 A family friendly hotel offering easy access to Normandy's main attractions. Local exploring - Ideally placed as a base for exploring Normandy. Sights nearby - View the 11th century Bayeux tapestry telling the story of William the Conqueror. 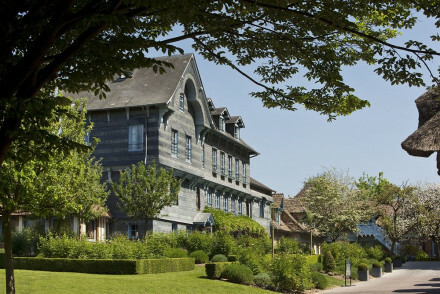 An elegant hotel in the countryside stunningly set on an island of the Seine. Charming rooms feature oak furniture and mosaic bathrooms. Outdoor pool, sunny terrace and gardens to enjoy. Excellent French cuisine which changes with the seasons. Traditional, pretty and peaceful. Le Landemer is located in Urville-Nacqueville, set in a renovated farmhouse on the coast of Normandy. The hotel offers smart accommodation boasting marvellous sea views, as well as bathrooms with crystal washbasins. Stunning seafood dishes served up at the restaurant! A wonderfully romantic spot. 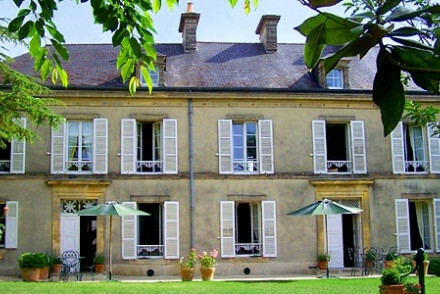 Elegant accommodation in the heart of Perche Regional Park, offering 8 charming en-suite rooms. Design is rustic chic with exposed stone wall, softly patterned fabrics and wooden beams. On-site, guests can enjoy the tea room, gym, garden and spa. A relaxing rural escape. 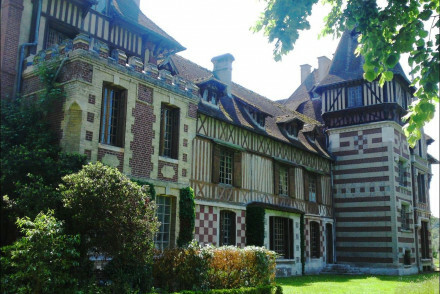 Short fly break - Just 160 km from Paris and located in a national park making this ideal for weekend rural escapes. Total relaxation - The spa has a jacuzzi, steam room and there is an on-site gym. Great walks - In the Perche Regional Nature Park, there are many of great walks and hiking trails. 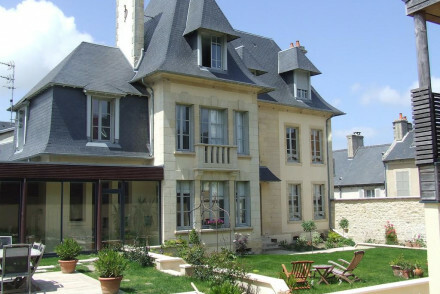 A charming 19th century townhouse set in the heart of the historic town of Bayeux. The four bedrooms are light and airy with a simple minimalist feel. A large garden offers a tranquil spot to unwind after a day spent exploring all of Bayeux's historic sights. Local exploring - Bayeux is a town steeped in history: the Bayeux Tapestry is a short walk away, as is Notre Dame Cathedral. Great walks - Take a stroll through the nearby Botanical Garden of Bayeux. Sights nearby - Visit the famed Museum of the Bayeux Tapestry. A smart sand-stone fronted B&B in the centre of Bayeux. Just two large and elegant bedrooms with parquet floors and high ceilings. Lovely garden and terrace. Ideal for a family or group of four. Sights nearby - Stone's throw from the famous tapestry. Excellent base for visiting the D Day landing beaches. A delightful timbered farmhouse with fantastic restaurant. Rustic chic interiors with high wooden beamed ceilings and lots of light. Rooms, suites, and family suites with sumptuous beds chalet-style. A peaceful rural setting for families, groups, or friends. Sights nearby - Only 4km from Honfleur and easy access to Deauville. 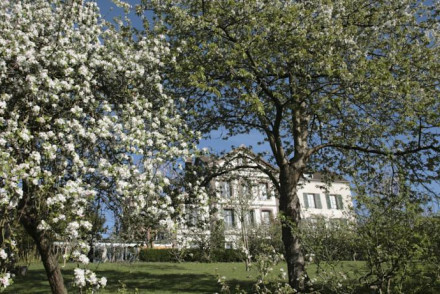 Chateau du Rozel stands tall beside several charming cottages. The rooms within the Chateau are tastefully decorated with lovely attention to detail. The cottages have their own facilities, some with views out to sea. All perfectly situated in a great location 5 minutes from the coast. Delightful! 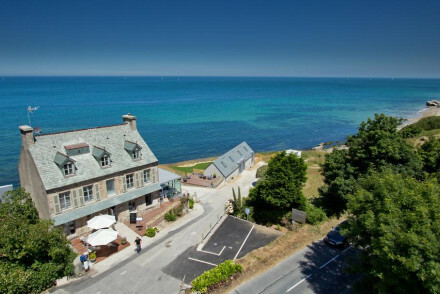 Seaside - located just 0.6 miles from the sea, near Jersey and Guernsey. An elegant grand hotel within Norman manors. Contemporary rooms have stone floors, soft colour schemes and big bathrooms. Indoor pool, spa and sauna. Cinema room, tennis court and extensive gardens with terrace. Fantastic cuisine in elegant dining room. Tasteful, quiet and pretty. 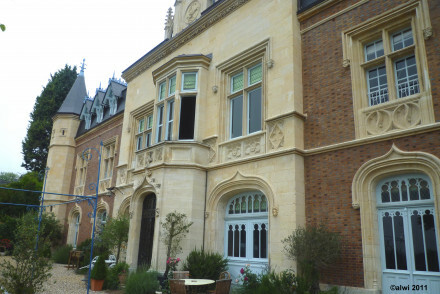 A plush hotel in central Bayeux minutes from the Bayeux Tapestry and D-Day landing beaches. Opulent rooms with rich fabrics and huge beds and excellent views of the cathedral. An upmarket hotel to explore the region from. Sights nearby - Steps from the Bayeux Tapestry and D Day landing beaches. 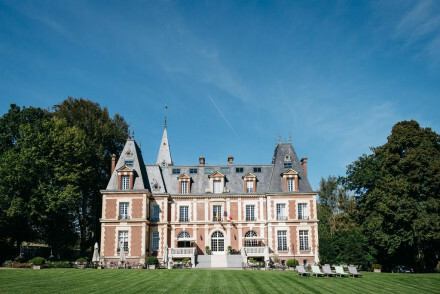 A beautiful 18th century chateau set within sprawling grounds. Traditionally styled throughout expect high ceilings, working fire places, chintz fabrics and elegant antiques. Indulgent breakfasts are served using local produce, there's a large pool and bikes to explore the area. Country Escape - A quintessential slice of rural France with chic interiors, beautiful countryside and fabulous food and wine. Great walks - Take long walks through the scenic countryside starting straight from the property. Fishing - Spend a day fishing in the carp pond (fishing tackle is provided). A renovated 17th century townhouse in Benouville. Four chic rooms are light and airy with a perfect mix of contemporary and traditional styles. Boasting a fabulous restaurant serving modern french cuisine. Walking distance from Pegasus Bridge, (a pivotal D-day site) and Caen is nearby. Business meetings - The seminar room can accommodate up to 50 people: catering and coffee is included for business meetings. Short fly break - Well positioned just 10 minutes from Caen and 2 hours from Paris. Foodies - Sample exemplary modern french cuisine at the hotel's restaurant. Sights nearby - History on your doorstep: the Bayeux Tapestry is only 40km away. 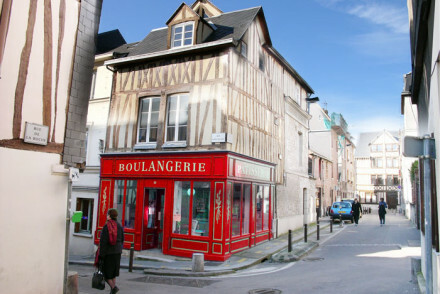 Charming, former 16th century presbytery in the centre of Honfleur. Individually furnished rooms offer an elegant mélange of wood, leather, velvet and stone and a luxurious whirlpool bath to boot. Come to Honfleur to explore the cobbled streets and the coast littered with WW1 memorials. A charming coastal property set in a tranquil spot. Individually styled rooms are traditionally dressed with floor to ceiling sash windows, intricately carved white furniture and well placed artworks. A fine dining restaurant serves French cuisine with a modern twist and is worthy of a visit alone. 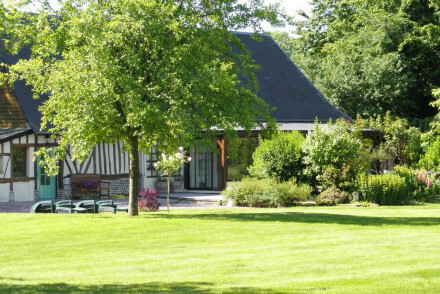 Local exploring - A tranquil coastal property ideally located to explore Normandy's countrside and attractions. Great walks - Embark on long walks through the picturesque Cotentin marshlands and woodlands. Sights nearby - Visit the nearby Normandy landing beaches and Mont Saint Michel. A former 18th century hunting lodge set in a secluded opening in an expanse of woodland. This attractive hotel has been luxuriously fitted with swish, stylish interiors. Very well suited to country escapes and seminar weekends. Country Escape - A cosy and welcmong former hunting lodge set in expansive woodlands, with plenty of outdoor activities and modern amenities. Fishing - Try your hand at trout fishing on the river, if you catch one the chef will happily prepair it for you. Great walks - Enjoy beautiful walks through the surrounding wooded parkland. Gorgeous spa hotel in the middle of Lyons la Foret. Chic contemporary rooms and suites, gourmet restaurant, and all the spa facilities one could want for. Excellent for families, foodies, and local exploring, or simply a spot of relaxation. Sights nearby - A wide selection of abbeys and chateaux close by. Only 30 mins from Rouen. 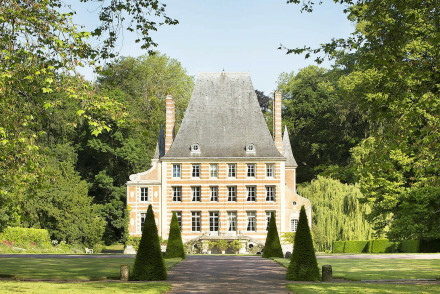 A picture perfect chateau boasting a secluded spot in Normandy. Elegant rooms are traditionally dressed with sunny hues, antiques and indulgent bathrooms. Beautifully restored reception rooms are ideal for glamorous events. A charming French escape. 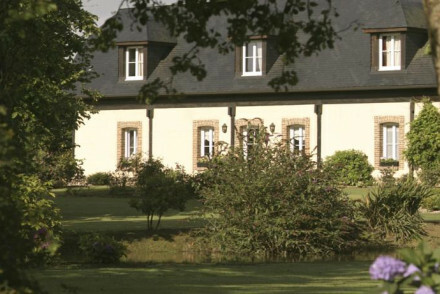 Country Escape - A relaxing stay in a tranquil spot surrounded by pretty Normandy countryside. Great walks - Discover miles of walking trails through the picturesque countryside. 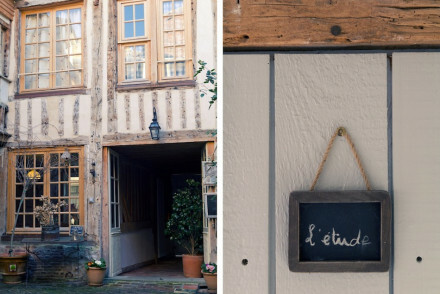 This gem of a B&B in Honfleur, 2km from the sea, has been created from two 19th-century townhouses. Stylish interiors in soft tones include original and interesting touches. French breakfasts can be taken in the garden if weather allows. Quiet location close to the pretty harbour and historic town. Each bedroom is individually decorated in French country style: floral quilts, traditional blue shutters and parquet floors covered in hand woven rugs and Louis XI chairs. These lead on to private terraces, an indoor pool, immaculate grounds and further the sea. Delightful with delicious breakfast. Sights nearby - Visit the towering turrets of Mont Saint-Michel, one of the most iconic sights in France. 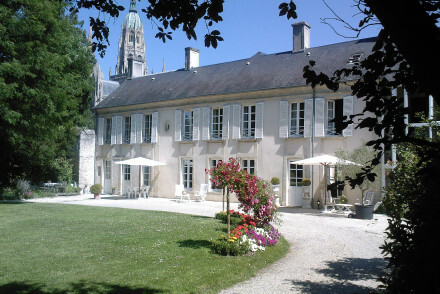 Stunning 15th century chateau with a fantastic table d'hotes and charming hosts. Romantic bedrooms and suites in soft pastels with wooden panelled walls, fourposter beds, and fireplaces. In-room massages, a swimming pool, and early supper for children. Romantic, but still family friendly. Foodies - Continental breakfast and 5 course set dinners by a Michelin chef. 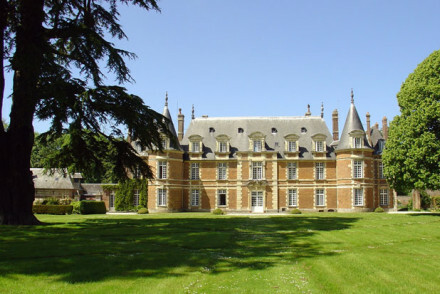 A stunning 18th chateau in beautiful grounds. Opulent rooms feature antique furniture and pretty wallpapers. Expansive gardens, outdoor pool and tennis court. Fantastic regional cuisine and luxurious interiors have fireplaces and beams. Romantic, gourmet, and very relaxing. An elegant guesthouse situated in it's own large, picturesque garden. The five bedrooms each have their own character and enjoy pretty views of the apple trees. Breakfast can be enjoyed in the garden or on the lovely terrace. A charming base for exploring historic and artistic Honfleur. Fishing - Honfleur is a maritime town and the fish which can be caught include sole, dogfish, gurnard and mackerel. Local markets - Every Saturday there is a traditional market in Honfleur and on Wednesdays there is an organic market. 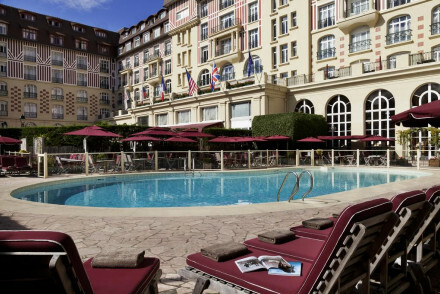 Sights nearby - Côte de Grace is 1.9 miles away and Deauville and its famous beaches are 10.6 miles away. Sailing - The old dock in Honfleur attracts many yachts. Luxuriously renovated coaching inn with fabulous suites. Contemporary elegance and modern comforts. Spacious suites with mezzanine levels, private terraces, and stand alone bath tubs. Sunny terraces for outdoor dining. Affordable, understated luxury. 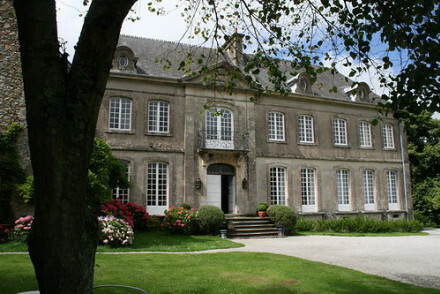 A historic Manor situated just outside Rouen, set in beautifully manicured gardens and parkland. Classically French throughout - think patterned wallpaper, rich hues, intricately carved antiques and wooden floors. A unique and intimate stay. 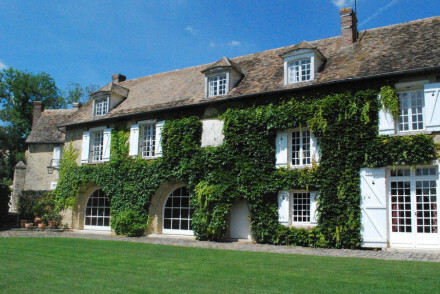 Country Escape - A quintessentially rural French property surrounded by picturesque countryside. Great walks - Take long walks through the pretty surrounding parkland and gardens. Sights nearby - Make a trip into Rouen and visit the impressive Cathedral. 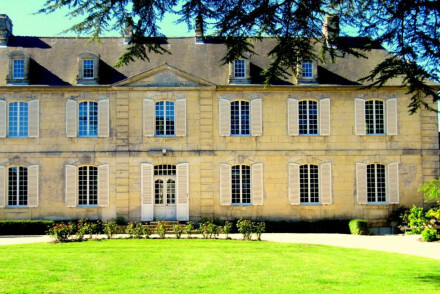 A grand and beautifully restored 18th century chateau, steeped in history and full of charm and character. Traditional rooms with marble fireplaces, antique furniture and parquet floors. 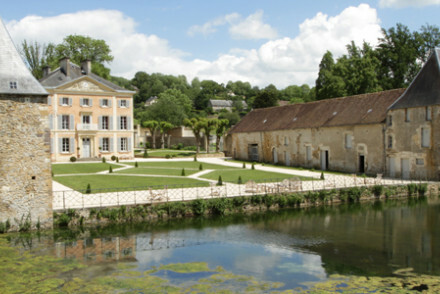 The chateau is surrounded by sweeping landscaped gardens and small canals. 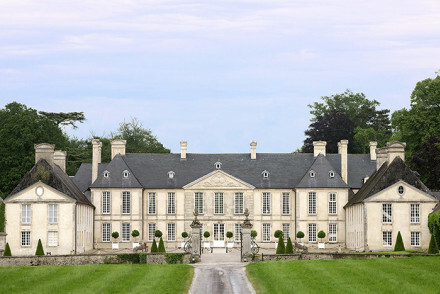 Traditional - The chateau was designed in 1765, by the architect Pierre-Raphaël de Lozon for the Marquis dʼOurville. A picture perfect ivy clad house boasting spectacular views across the valley. Rooms are spacious and traditional with high ceilings, exposed beams and antiques. The characterful treehouse is ideal for families. A quiet and picturesque base to explore the region from. Country Escape - A luxurious and atmospheric property offering glorious views and utter tranquility. 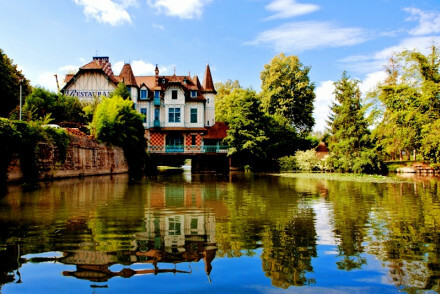 Sights nearby - Visit Claude Monet’s house and gardens in Giverny. Kayaking - Spend an afternoon kayaking on the Eure river. Fabulous boutique B&B with rooms and self-catering apartments. Individually designed rooms with great attention to detail - from lashings of modern style to cosy fireplaces and vaulted ceilings. Ideal for couples, groups of friends, or those looking for the privacy of an apartment. 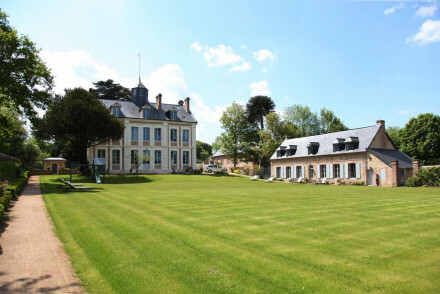 An elegant hotel set on a 27 hole golf course in the green heart of Normandy. Stylish rooms are light and bright with simple, yet luxurious, design. Downstairs expect Scottish tartans and Chesterfield furniture. Boasting a pool, tennis courts and gym; there's entertainment for all. Total relaxation - Leave the kids at the kids club and play a round of golf. Afterwards, head to the spa for a massage. Business meetings - The multimedia-fitted seminar rooms can fit up to 250 people. Beach Life - 5 minute drive from the beaches of Normandy. 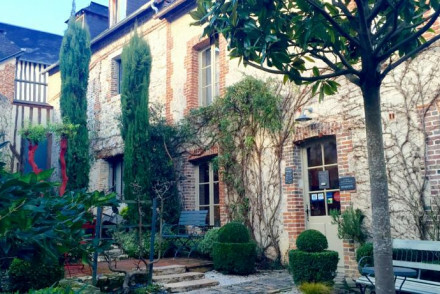 Stunning hotel tucked away in the sleepy Norman village of Surville. 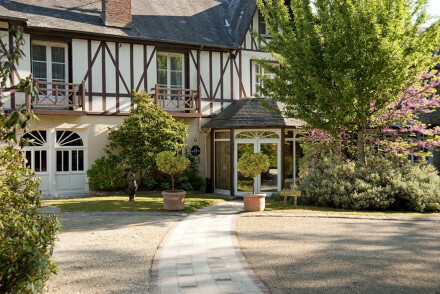 Manoir de Surville features all the creature comforts you need for a relaxing break with luxurious rooms, a superb spa and an excellent restaurant. Sights nearby - Visit the nearby Château de Gaillon and Château du Champ de Bataille. Great walks - The surrounding countryside is full of beautiful walking routes. A unique hotel B&B set in three different buildings in central Honfleur. Rooms, suites, and a private cottage all beautifully decorated in different styles: rustic farmhouse, Mediterranean, loft conversion. The bathrooms have huge bathtubs, some with private jacuzzis. Fantastic. A striking rural property set in pretty gardens. Find quintessentially french design in the rooms featuring chintz fabrics and patterns, large sash windows and some with four poster beds. An elegant lounge is the perfect spot to unwind with a regional tipple. A gorgeous rural retreat. Country Escape - A stunning rural property set in lovely gardens, it is the ideal spot to get away from it all. Sights nearby - Wander along the pretty Port of Honfleur and soak up the sights. A charming, secluded B&B set in an 18th century farmhouse. Offering four comfortable rooms, each are individually decorated with views looking out onto the garden. The garden itself is perfect for a relaxing afternoon and features a heated outdoor pool. Ideal for a romantic weekend away. Local markets - Pick your way through the local market in Houx. Great walks - Enjoy lovely walks along the Voise Canal. 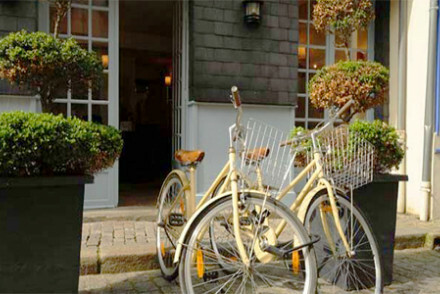 A cozy 18th century hotel with undeniable French charm and romance. Airy, elegant rooms, a verdant courtyard and terrace. A cellar spa hot tub and large, lofty suites showcase the hotel's relaxed environment. Close to lots of exciting restaurants in this picturesque northwestern port. Sights nearby - Close to Mont St Michel, the Normandy Landing Beaches and Deauville, Trouville and Etretat. Great walks - Climb to the Chapel of Notre-Dame de Grâce. 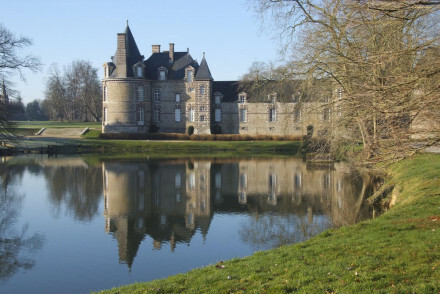 A stunning chateau hidden amongst rolling parkland in rural Normandy. The rooms are resplendent with beautifully embroidered furniture, antique beds and period wall papers. 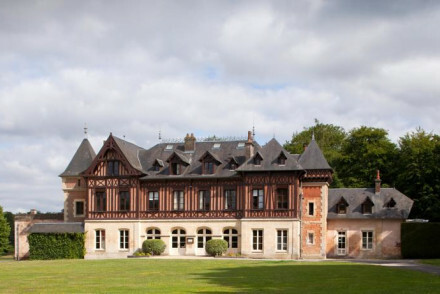 For an amazing hotel, full of heritage, Chateau de Chantore is the place. Romantic Break - A secluded and intimate spot, ideal for a romantic break in Lower Normandy and Mont Saint Michel. Sights nearby - Seven miles from the stunning Mont Saint Michel Abbey. A stunning chateau with spectacular interiors. Enormous bedrooms have fireplaces, four poster beds, and luxurious fabrics in traditional style. Each living area or salon is filled with antiques and art works. A fairytale spot with a fantastic nearby restaurant, available for exclusive use too. Wine tasting - The best Calvados in France is distilled a mile down the road. Calvados Camus. Luxury - Old world charm and luxury. 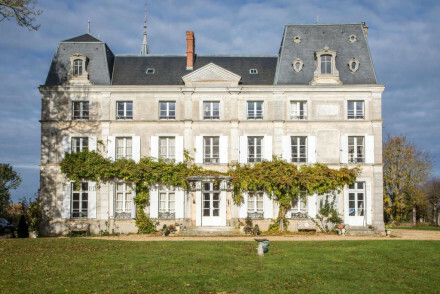 A gorgeous 18th century Chateau steeped in history. Bedrooms provide character and comfort in equal measure with pretty furnishings, wall panelling and parquet flooring. The garden and swimming pool offer a spot for relaxation after a day of exploring. Enjoy a delicious continental breakfast daily. A 4 star hotel and restaurant in a quiet village near the Perche Natural Regional Park. Spacious, individually designed and elegantly decorated rooms. Gastrnomic restaurant serving local produce. Beautiful gardens with terrace. Perfectly placed to explore historic and beautiful Normandy. Traditional on the outside, whereas inside contemporary/modern prevails with art-deco furniture and classy, ornate decorations. Rooms are smartly furnished and bathrooms beautiful. Not only that, but Michelin starred cuisine and just round the corner from Monet's house and gardens at Giverny. 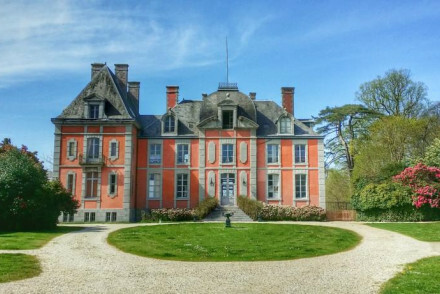 A whimsical Renaissance château set within 50 acres of grounds. Interiors brim with character, expect: elegant antiques, tapestries, working fireplaces and classic french patterns. There's plenty to do within the property from fishing to cycling and it's also well positioned to explore the region. Country Escape - A quintessentially french country escape with chic interiors, indulgent breakfast and fantastic walks. Local markets - Sample regional produce at one of the local farmers markets that run throughout the week. A beautiful chateau in a rural location. Elegance and classical grace from the Louis XVI furniture, to Italianate stairwells, sumptuous bedrooms, and fairytale views. A stately home, (also available for exclusive use) perfect for romantics, groups or families. Sights nearby - Discover the Bayeux tapestry and the Normandy landing beaches. A striking half-timber house set in lovely mature gardens between a forest and the sea. Charming traditional rooms are individually styled with classic french patterns, antiques and soft hues. A produce inspired restaurant is fantastic and there's a pool and small spa to boot. Country Escape - A half-timber country house set between the forest and sea. A large elegant hotel on the sea front. Immaculate bedrooms and suites in contemporary style with private balconies looking out to sea, stand alone bath tubs, and all the modern gadgetry. Plenty of restaurants and bars bring diversity to a seaside family holiday. An elegant hotel set in the heart of a National Park and on the banks of the Seine. Charming rooms feature exposed brick walls, wooden beams and bookshelves. Terraces and gardens to relax in. Outstanding French cuisine and a lovely bar area. A wonderful choice for local exploring in the countryside. 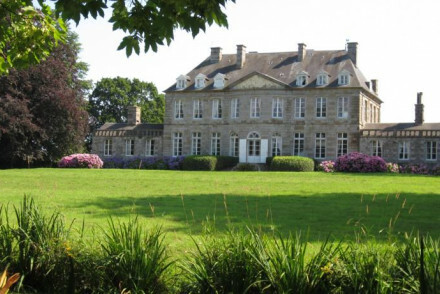 A stunning 18th century chateau boasting a scenic and tranquil location just outside Bayeux. A handful of elegant rooms are traditional yet unfussy with a choice selection of antiques, floor to ceiling windows and indulgent bathrooms. A delightful base from which to explore the region. 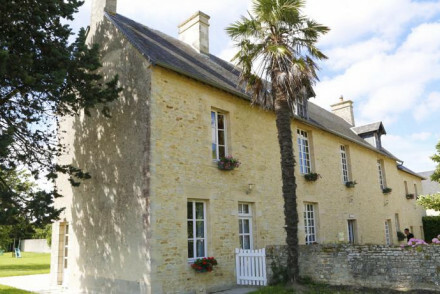 Local exploring - Ideally located in Normandy between Bayeux, Caen and the Landing Beaches. Sights nearby - Admire the striking architecture of the Abbey of Saint-Étienne in Caen. 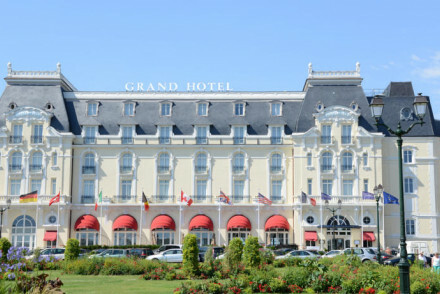 Luxury accommodation in Deauville just a short walk from the beach. Spacious rooms blend contemporary and traditional styles. An elegant restaurant offers fine-dining, there's an indulgent spa, outdoor pool and bicycles available. A place to indulge and unwind. Families - Family-sized rooms are available, and there is a Kids Club and on-site nursery. Cots are available on request. Business meetings - 12 high-tech, fully-equipped seminar rooms available that can fit up to 150 people. Spa breaks - There is a Diane Barrière Spa, gym, pool, hammam, sauna and hairdresser. 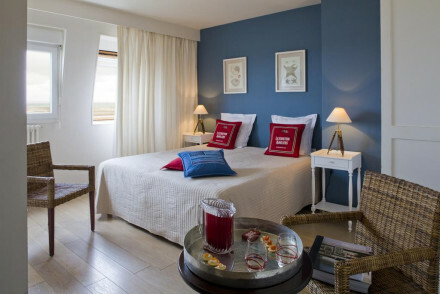 A gorgeous little hotel with chic rooms on the seafront. Large airy rooms and suites with contemporary furnishings and artistic flair. Fabulous restaurant, gardens and terraces, and immediate access to the beach. A great spot for a romantic break. A chic country house offering superb dining and characterful accommodation. Lavish rooms are decorated with rich hues, heavy fabrics and bold patterns. The highly acclaimed restaurant uses local produce to great effect. A luxurious base to explore the region from. Foodies - Sample exemplary regional dishes in the hotel's restaurant. Great walks - Take long walks along the scenic clifftop GR21 trail. 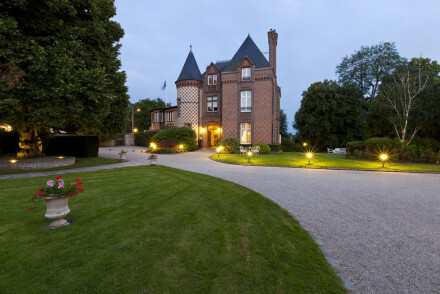 A fabulous Five Star hotel on the coast of Hornfleur. Top of the range spa with Turkish hammam, a fine dining restaurant, stunning rooms and suites, roof top terrace with sea views. The perfect spot to unwind in, for the luxury traveller. Foodies - Le Restaurant is a fine dining restaurant that specialises in regional cuisine. Spa breaks - La Ferme de Beaute is a fully equipped spa with Turkish hammam and body wraps. 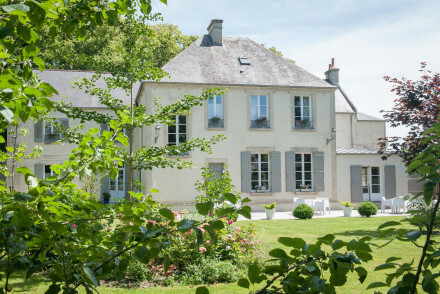 A beautifully restored property in a tranquil spot just outside Honfleur. Spacious rooms perfectly mix modern and traditional styles with wooden floors, enormous sash windows and a choice selection of antiques. An indoor pool, wellness centre and manicured gardens make this a very relaxing stay. Country Escape - A secluded estate set in picturesque Normany countryside. Sights nearby - Marvel at the beautiful Église Ste-Catherine a wooden church dating back to the late 15th century. Cooking classes - Take cookery lessons in the hotel's kitchen taken by a renowned pastry chef from Honfleur. Great walks - Embark on long walks along the scenic coast. 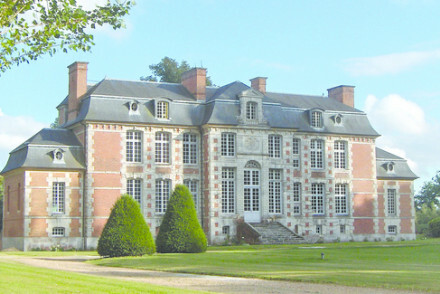 A fairy-tale like chateau set on a 700 acre estate. Beautifully kept throughout, the property offers numerous reception rooms filled with antiques and boasting roaring fires. Elegant rooms are individually styled with rich hues, patterned wallpaper and heavily draped bed heads. A luxurious stay. Country Escape - Set on seven-hundred rolling acres of Norman countryside, the ultimate high-end rural escape. Sights nearby - The famed sights of Mont Saint Michel and the Bayeux Tapestry are within easy reach. Great walks - Find no shortages of walks through the varied landscapes of the estate. Fishing - Spend a tranquil afternoon fishing on the property's pond. 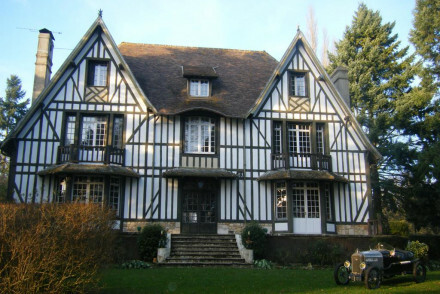 A chic rural property set just outside Hornfleur. Rooms mix contemporary and traditional styles; dotted with artworks and antiques, the best have roll-top baths. Regional dishes can be sampled in the restaurant and days can be spent walking, horse riding or cycling. A charming rural escape. Active Holiday - Get out into the countryside and explore by bike, foot or horse back. Cooking classes - Learn how to cook dishes of the region in a class run by the hotel's chef.